What's your favorite kind of vacation? Do you like to relax all day? Visit a new city? An action packed adventurous trip? While I love island and beach vacations, I'm not a fan of sitting on the beach all day. I can take a few hours of it here and there, especially at the pool when there is a swim-up bar, but I'd much rather get out and explore, eat where the locals eat, and bar-hop around the island (oh how I miss St. John for that!!). Luckily my husband has the same vacation philosophy, so we have taken some great trips together. My best vacation memories usually revolve around food, and two of my favorite food destinations (besides Vegas), have been in Mexico. 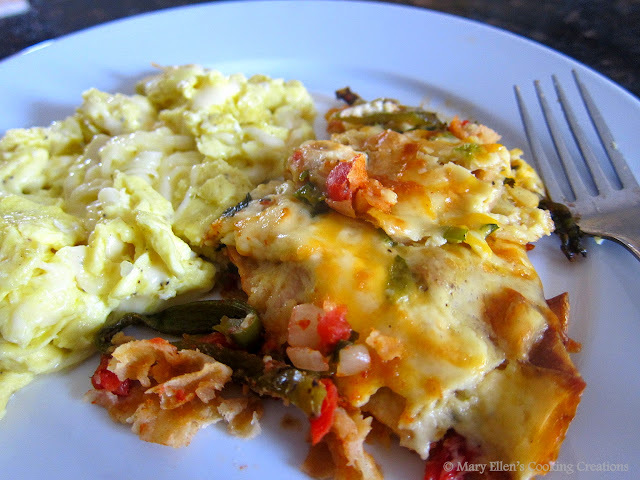 Every time we make Mexican food at home, we reminisce about the Love Shack in Cabo - a family run "dive bar" with grandmom cooking in the kitchen (literally, the family's grandmother was in the kitchen cooking all of the food... amazing food!). And then there were the street tacos in Playa del Carmen - I could eat them every day and dream of going back just for those tacos. And how could I forget breakfast on the water in Cabo while watching the whales migrate - of course chilaquilies were on my plate. See, it always comes back to food. I may not remember what we learned on a tour, but I sure as hell could tell you where we ate that day and what we had. 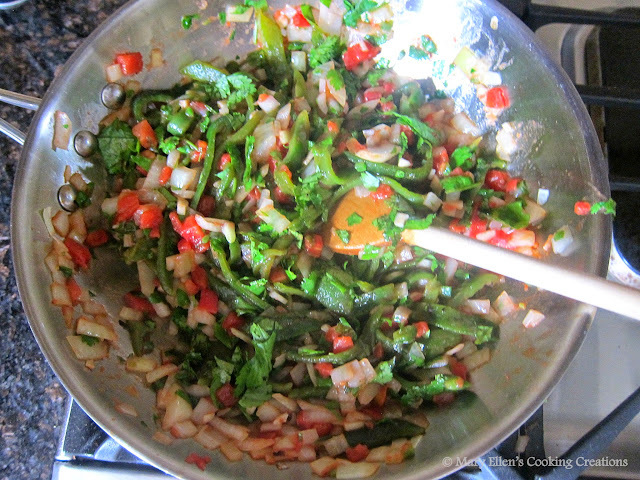 I've recreated a lot of these dishes at home, but still have chilaquilies on my "must make soon" list. 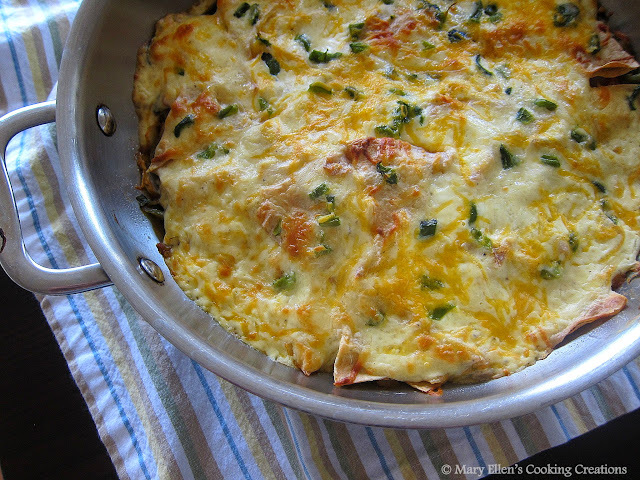 As soon as I saw Josie's post for this Creamy Poblano-Tortilla Casserole and read through the ingredients and directions, I knew it would satisfy by chilaquilies craving. Crisp tortilla chips softened by a savory cheesy sauce and packed full of peppers, tomatoes and onions? Yes, please. This dish can take some time to pull together, but that's probably because I made it all at once (and the three year old was a bit crazy this afternoon so I did have to step away from the stove a few times). You could certainly do some prep earlier, like make the chips or roast the peppers. Alternatively, you could buy your own corn tortilla chips, but honestly there's nothing like chips made from soft corn tortillas. Whatever you do, just make this. The flavors took me right back to Cabo, the cheese sauce was creamy and salty and gooey, the filling was bright yet slightly spicy, and the chips were soggy in the best possible way. As soon as I had my first bite I decided that I'd be eating seconds, and then I'd have the rest alongside some scrambled eggs the next morning. And that's exactly what I did. 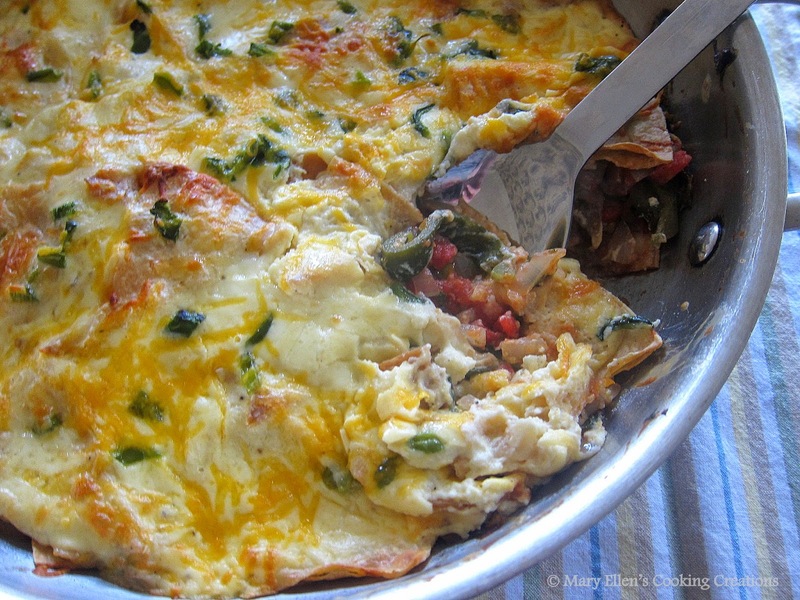 I think I'd even make this one again JUST to be able to have it the next day for breakfast! Think deconstructed huevos rancheros. Josie, thank you so much for making and sharing this recipe!